I'm a fifteen year vegetarian married to a bacon loving omnivore. This doesn't cause conflict since he genuinely loves eating good vegetarian meals and I also indulge the meat beast within him from occasion. One such occasion of indulgence bore Ham Solo in CandyBaronite! I was initially just considering dipping bacon in chocolate to make Christmas goodies. And the chocolate dipped bacon strips were enjoyed. As were the chocolate candies filled with chopped bacon. And the smaller nuggets you see closer in the picture are small bites of bacon with natural peanut butter smeared on top then dipped in chocolate...because why wouldn't salty natural peanut butter (minus added sugars) make bacon and chocolate even better? I am a vegetarian but I do remember the taste of the meat candy that is bacon. ...and use use the Han Solo in Carbonite candy mold I made? So I poured in a layer of chocolate. Laid down a slice of bacon. Smeared on some natural peanut butter. And poured on more chocolate. It looks unassuming just like past Han Solo in Candybaronite creations I made. At least from this side. The otherside begins to give away something being different where the peanut butter touched the sides of the mold. HAM Solo in CandyBaronite! 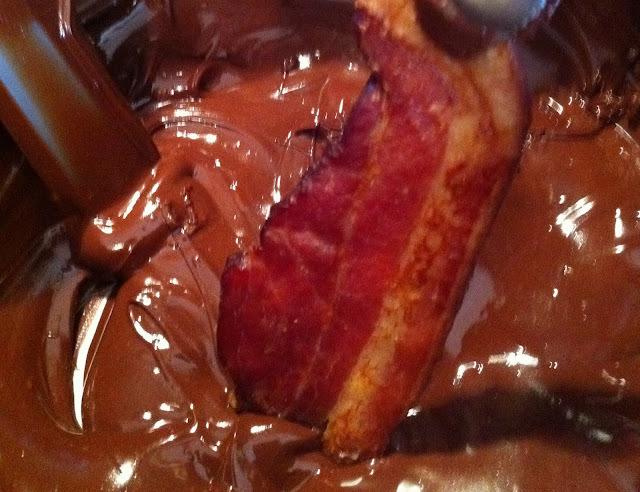 The carnivores all raved and said I need to do more indulging of bacon lovers in my sweets.